Home›Technology › What about Rain Fade? We’ve landed on the moon, sent robots to explore other planets, developed incredible geostationary meteorological satellites for weather forecasting and we’re beginning to understand how pollution and global warming affect our atmosphere. It’s all extremely impressive and is directly linked to developments in technology. Environmental conditions, precipitation and, to some extent, humidity can interfere with the satellite signals. This seems to be more pertinent with Ka-band than Ku-band due to the higher frequencies used. However, Telenor Satellite has taken Mother Nature by the horns and tackled this very issue head-on. With our recently launched THOR 7 satellite, we’ve included a raft of technical innovations including revolutionary teleport antenna diversity technology. This works by automatically switching to a backup ground station which is unaffected by the weather front. We’ve combined this with advanced adaptive modulation and coding techniques, which ensure sufficient power and perfect Quality of Service throughout the coverage area in any conditions, resulting in market-leading up-time exceeding 99.8%. THOR 7 is not only remarkable for its ability to avoid any rain fade concerns, but unlike traditional single beam Ku-band satellites, it works by introducing 24 smaller overlapping spot beams to cover the entire footprint. This new configuration offers more throughput and higher Quality of Service compared to traditional wide-beam Ku-band satellites allowing for a more concentrated signal whichever their route. Spot beam architecture also brings with it something very special for maritime mobile users; the ability to experience premium quality connectivity on much smaller antennas – which is simply not possible on Ku-band satellites. As well as reducing CAPEX, smaller antennas are easier to install and service, and they open the door for more vessels to upgrade their on board communications. 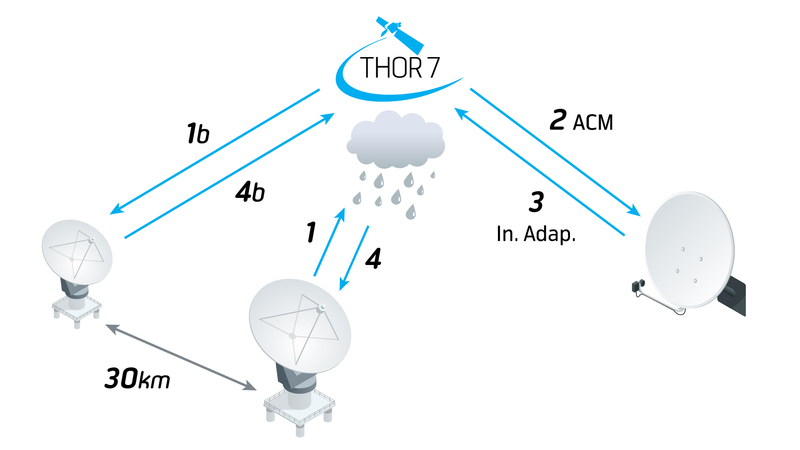 THOR 7 is a revolutionary satellite, leaning on the latest technologies to deliver great efficiency with large amounts of data at reasonable costs. Satellite communications is changing so much about how we stay connected already and at sea there is no exception – whatever the weather.